The Battle of Oriskany on August 6, 1777 was one of the bloodiest battles in the North American theater of the American Revolutionary War and a significant engagement of the Saratoga campaign. An American party trying to relieve the siege of Fort Stanwix was ambushed by a party of Loyalists and allies of several American Indian tribes, primarily Iroquois. This was one of the few battles in the war in which almost all of the participants were American; Patriots and allied Oneida fought against Loyalists and allied Indians in the absence of British regular soldiers. The American relief force came from the Mohawk Valley under General Nicholas Herkimer and numbered around 800 men of the Tryon County militia plus a party of Oneida warriors. British commander Barry St. Leger authorized an intercept force consisting of a Hanau Jäger (light infantry) detachment, Sir John Johnson's King's Royal Regiment of New York, Indian allies from the Six Nations, particularly Mohawks and Senecas and other tribes to the north and west, and Indian Department Rangers, totaling at least 450 men. The Loyalist and Indian force ambushed Herkimer's force in a small valley about six miles (10 km) east of Fort Stanwix, near the village of Oriskany, New York. Herkimer was mortally wounded, and the battle cost the Patriots approximately 450 casualties, while the Loyalists and Indians lost approximately 150 dead and wounded. The result of the battle remains ambiguous. The apparent Loyalist victory was significantly affected by a sortie from Fort Stanwix in which the Loyalist camps were sacked, damaging morale among the allied Indians. The battle also marked the beginning of a civil war among the Iroquois, as Oneida warriors under Colonel Louis and Han Yerry allied with the American cause. Most of the other Iroquois tribes allied with the British, especially the Mohawks and Senecas. Each tribe was highly decentralized, and there were internal divisions among bands of the Oneida, some of whom also migrated to Canada as allies of the British. The site is known in Iroquois oral histories as "A Place of Great Sadness." The site has been designated by the United States as a National Historic Landmark; it is marked by a battle monument at the Oriskany Battlefield State Historic Site. In June 1777, the British Army, under the command of General "Gentleman Johnny" Burgoyne, launched a two-pronged attack from Quebec. Burgoyne's objective was to split New England from the other colonies by gaining control of New York's Hudson Valley. The main thrust came south across Lake Champlain under Burgoyne's command; the second thrust was led by Lt. Colonel Barry St. Leger and was intended to come down the Mohawk Valley and meet Burgoyne's army near Albany. St. Leger's expedition consisted of about 1,800 men, who were a mix of British regulars, Hessian Jägers from Hanau, Loyalists, Indians of several tribes, including the Mohawk and Seneca of the Iroquois, and Rangers. They traveled up the Saint Lawrence River and along the shore of Lake Ontario to the Oswego River, which they ascended to reach the Oneida Carry (present-day Rome, New York later developed here). They began to besiege Fort Stanwix, a Continental Army post guarding the portage. Alerted to the possibility of a British attack along the Mohawk River, Nicholas Herkimer, the head of Tryon County's Committee of Safety, issued a proclamation on July 17 warning of possible military activity and urging the people to respond if needed. Warned by friendly Oneidas on July 30 that the British were just four days from Fort Stanwix, Herkimer put out a call-to-arms. The force raised totaled 800 from the Tryon County militia; it was composed primarily of poorly trained farmers, who were chiefly of Palatine German descent. Setting out on August 4, the column camped near the Oneida village of Oriska on August 5. While a number of the militia dropped out of the column due to their lack of conditioning, Herkimer's forces were augmented by a company of 60 to 100 Oneida warriors, led primarily by Han Yerry, a strong supporter of the Patriot cause. That evening, Herkimer sent three men toward the fort with messages for the fort's commander, Colonel Peter Gansevoort. Gansevoort was to signal the receipt of the message with three cannon shots, and then sortie to meet the approaching column. Due to difficulties in penetrating the British lines, these couriers did not deliver the message until late the next morning, after the battle was already underway. St. Leger learned on August 5 from a messenger sent by Molly Brant to her brother Joseph Brant, the Mohawk leader who led a portion of St. Leger's Indian contingent, that Herkimer and his relief expedition were on their way. St. Leger sent a detachment of light infantry from Sir John Johnson's Royal Yorkers toward the position that evening to monitor Herkimer's position, and Brant followed early the next morning with about 400 Indians and Butler's Rangers. Although many of the Indians were armed with muskets, some were not, and only carried tomahawk and spear. On the morning of August 6, Herkimer held a war council. Since his force had not yet heard the expected signal from the fort, he wanted to wait. However, his captains pressed him to continue, accusing Herkimer of being a Tory because his brother was serving under St. Leger. Stung by these accusations, Herkimer ordered the column to march on toward Stanwix. About six miles (9.6 km) from the fort, the road dipped more than fifty feet (15 m) into a marshy ravine, where a stream about three feet (1 m) wide meandered along the bottom. Sayenqueraghta and Cornplanter, two Seneca war chiefs, chose this place to set up an ambush. While the King's Royal Yorkers waited behind a nearby rise, the Indians concealed themselves on both sides of the ravine. The plan was for the Yorkers to stop the head of the column, after which the Indians would attack the extended column. At about 10 am, Herkimer's column, with Herkimer on horseback near the front, descended into the ravine, crossed the stream, and began ascending the other side. Contrary to the plan, the Indians lying in wait near the rear of the column, apparently unable to contain themselves any longer, opened fire, taking the column completely by surprise. Leading the 1st Regiment (Canajoharie district), Colonel Ebenezer Cox was shot off his horse and killed in the first volley. Herkimer turned his horse to see the action and was very shortly thereafter struck by a ball, which shattered his leg and killed the horse. He was carried by several of his officers to a beech tree, where his men urged him to retire from further danger. He defiantly replied, "I will face the enemy", and calmly sat leaning against the tree, smoking a pipe and giving directions and words of encouragement to the men nearby. As the trap had been sprung too early, portions of the column had not yet entered the ravine. Most of these men panicked and fled; some of the attacking Indians pursued them, resulting in a string of dead and wounded that extended for several miles. Between the loss of the column rear and those killed or wounded in the initial volleys, only about one half of Herkimer's men were likely still fighting thirty minutes into the battle. Some of the attackers, notably those not armed with muskets, waited for the flash of an opponent's musket fire before rushing to attack with the tomahawk before the enemy had time to reload, a highly effective tactic against those men who did not have bayonets. Louis Atayataronghta, a Mohawk warrior fighting with Herkimer's men, shot one of the enemies whose fire had been devastating in its accuracy, noting that "every time he rises up he kills one of our men". Herkimer's men eventually rallied, fighting their way out of the ravine to the crest just to its west. John Johnson, concerned about the militia's tenacity, returned to the British camp and requested some reinforcements from St. Leger shortly before a thunderstorm broke out. Another seventy men headed back with him toward the battle. The thunderstorm caused a one-hour break in the fighting, during which Herkimer regrouped his militia on the higher ground. He instructed his men to fight in pairs: while one man fired and reloaded, the other waited and then only fired if attacked. Ordered to fire in relays, the pairs were to try to keep at least one weapon loaded at all times, to reduce the effectiveness of the tomahawk attacks. John Butler, the leader of the rangers, took time during the thunderstorm to question some of the captives and learned about the three-cannon signal. When Johnson and his reinforcements arrived, Butler convinced them to turn their coats inside out to disguise themselves as a relief party coming from the fort. When the fighting restarted, Johnson and the rest of his Royal Yorkers joined the battle, but one of the Patriot militiamen, Captain Jacob Gardinier, recognized the face of a Loyalist neighbor. Close combat, at times hand-to-hand fighting between neighbors, continued for some time. When Herkimer's messengers reached the fort around 11 am, Colonel Gansevoort began organizing the requested sortie. After the heavy thunderstorm passed, Lieutenant Colonel Marinus Willett led 250 men from the fort and proceeded to raid the nearly deserted enemy camps to the south of the fort. Driving away the few British and Indians left in those camps (who included women) and taking four prisoners along the way, the Patriots collected blankets and other personal possessions from the Indian camps. They also successfully raided John Johnson's camp, taking his letters and other writings (including an intercepted letter to Gansevoort from his fiancée). One of the Indians who had stayed behind to guard the camp ran to the battlefield to alert fellow warriors that their camps were being raided. They disengaged with cries of "Oonah, oonah! ", the Seneca signal to retire, and headed for the camps to protect their women and possessions. This forced the smaller number of German and Loyalist combatants to also withdraw. Herkimer was seriously wounded and many of his captains were killed, and the battered remnant retreated to Fort Dayton. Herkimer's men carried him from the battlefield and his leg was amputated, but the operation went poorly and he died on August 16. The Indians retrieved most of their dead from the battlefield the following day, but many dead and wounded Patriots were left on the field. Benedict Arnold's relief column marched through the scene several weeks later and were moved by the stench and grisly scene. General Philip Schuyler learned of the retreat from Oriskany and immediately organized additional relief to be sent to the area. The siege at Fort Stanwix was eventually lifted on August 21 when a relief column approached, led by General Benedict Arnold. While still at Fort Dayton, Arnold sent messengers into the British camp who convinced the British and Indian besiegers that his force was much larger than it actually was. Loyalist John Butler was promoted to Lieutenant Colonel for his role in the battle, and he was authorized to raise a regiment that became known as Butler's Rangers. After the siege was lifted, some Loyalists returned to Quebec while others joined Burgoyne's campaign on the Hudson, including numerous warriors from various tribes. Brant and Seneca chief Sayenqueraghta proposed the next day to continue the fighting by pursuing the Patriots downriver toward German Flatts, New York, but St. Leger turned them down. This battle marked the beginning of the civil war in the Iroquois Confederacy, as it was the first time that the tribes had fought against one other. The Mohawks, Senecas, Cayugas, and Onondagas were allied with the British, as were some Oneidas, and the Iroquois in St. Leger's camp met in council and decided to send the Patriot-allied Oneidas a bloody hatchet. Brant's Mohawks raided and burned the Oneida settlement of Oriska later in the siege. In retaliation, the Oneidas plundered the Mohawk strongholds of Tiononderoge and Canajoharie. They later raided the Fort Hunter Mohawks, prompting most of the remaining Mohawks in central New York to flee to Quebec. Brant's Indians were said to have tortured and eaten some of their prisoners, although modern historians dispute this. It is likely that some of the prisoners were ritually killed, but there does not appear to be any evidence of cannibalism. The battle was one of the bloodiest of the war, based on the percentage of casualties suffered. 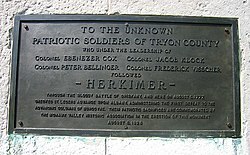 About half of Herkimer's force were killed or wounded, as were about 15-percent of the British force. St. Leger claimed the battle as a victory, as he had stopped the American relief column, but the Americans maintained control of the battlefield after the withdrawal of the opposing Indians. The British victory was tempered by the discontentment of the Indians after the battle. When they joined the expedition, they expected that the British forces would do most of the fighting, but they were the dominant fighters in this action, and some suffered the loss of their personal belongings taken during the American sortie from the fort. This blow to their morale contributed to the eventual failure of St. Leger's expedition. Blacksnake was one of the Indians at the battle, and he was interviewed many years afterwards. He recalled, "I thought at that time the Blood Shed a Stream running down on the decending [sic] ground." A monument was erected in 1884 to commemorate the battle at 43° 10.6′N 75° 22.2′W, and much of the battlefield is now preserved in the Oriskany Battlefield State Historic Site. The site was recognized as a National Historic Landmark in 1962, and added to the National Register of Historic Places in 1966. The town of Herkimer (town), New York and Herkimer County, New York were named in Herkimer's honor. The battle was honored by the name of aircraft carrier USS Oriskany, launched in 1945, and also by the issuance of a postage stamp in 1977. ^ Figures obtained from Glatthaar (2006), pp. 160, 356. He notes on p. 356 that 10–20% of Herkimer's column falls out before reaching the battlefield. The Oneida figures are his estimate, based in part on oral tradition, and include at least one Mohawk, Louis Atayataronghta (see battle description for quote). ^ Bilharz (2009), p. 93. ^ Cookinham (1915), p. 340. Benton, Nathaniel Soley (1856). A history of Herkimer County. Albany: J. Munsell. OCLC 1634048. Bilharz, Joy (February 2009). Oriskany: A Place of Great Sadness/ A Mohawk Valley Battlefield Ethnography (PDF). National Park Service. OCLC 464237289. Retrieved August 21, 2016. Bowler, R. Arthur; Wilson, Bruce G. (1979). "Butler, John". In Halpenny, Francess G (ed.). Dictionary of Canadian Biography. IV (1771–1800) (online ed.). University of Toronto Press. Canfield, William Walker; Clark, J. E. (1909). Things worth knowing about Oneida County. Utica, New York: T. J. Griffiths. OCLC 6674932. Cookinham, Henry J. (1915). "The Battle of Oriskany". Proceedings of the New York Historical Association, Volume 14. New York Historical Association. Dieffenbacher, Jane W; Herkimer County Historical Society (2002). Herkimer County: Valley Towns. Charleston, SC: Arcadia Publishing. ISBN 978-0-7385-0977-8. OCLC 50147332. Foote, Allan D (1998). Liberty March, The Battle of Oriskany. North Country Books. ISBN 0-925168-72-6. Glatthaar, Joseph T; Martin, James Kirby (2006). Forgotten Allies: The Oneida Indians and the American Revolution. New York: Hill and Wang. ISBN 978-0-8090-4601-0. OCLC 63178983. Greene, Nelson (1925). History Of The Mohawk Valley, Gateway To The West, 1614–1925. Reprint Services Corp. ISBN 0-7812-5180-X. Kelsay, Isabel (1984). Joseph Brant 1743–1807 Man of Two Worlds. Syracuse, NY: Syracuse University Press. ISBN 0-8156-0182-4. Kenney, Alice P (1975). Stubborn for Liberty: The Dutch in New York. Syracuse, NY: Syracuse University Press. ISBN 0-8156-0113-1. National Park Service (January 23, 2007). "National Register Information System". National Register of Historic Places. National Park Service. "Oriskany Battlefield". National Historic Landmark summary listing. National Park Service. September 11, 2007. "Oriskany". Dictionary of American Naval Fighting Ships. Navy Department, Naval History and Heritage Command. Retrieved December 7, 2009. Stone, William Leete (1865) . Life of Joseph Brant. Albany, NY: J. Monsell. OCLC 3509591. Watt, Gavin K (2002). Rebellion in the Mohawk Valley: The St. Leger Expedition of 1777. Toronto: Dundurn. ISBN 1-55002-376-4. OCLC 49305965. Berleth, Richard (2009). Bloody Mohawk: the French and Indian War & American Revolution on New York's Frontier. Hensonville, NY: Black Dome Press. ISBN 978-1-883789-66-4. OCLC 454376897. Edmonds, Walter D (1937). Drums Along the Mohawk. Little, Brown. ISBN 0-8156-0457-2. Wikisource has the text of the 1911 Encyclopædia Britannica article Oriskany. Wikimedia Commons has media related to Battle of Oriskany. This page was last edited on 7 August 2018, at 18:07 (UTC).